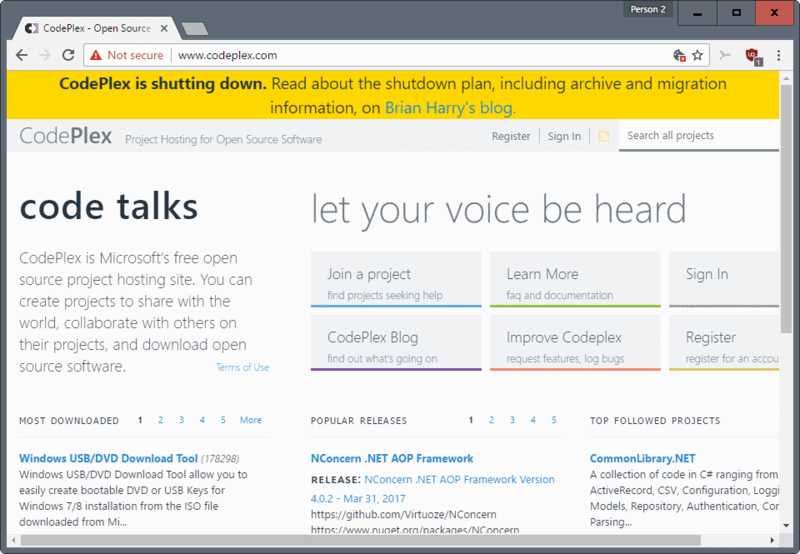 Microsoft announced yesterday that it will shut down its open-source project hosting website CodePlex on December 15, 2017. The company launched CodePlex in 2006 as a place to "share software". CodePlex enabled anyone to create and share projects. The site offered various tools for that, including a wiki software, source control based on Mercurial, Subversion, Git discussion forums, issues tracking, RSS support, and a lot more. Reasons for shutting down CodePlex include a decrease in usage -- less than 350 projects hat a code commit in the past 30 days -- a spam epidemic in 2015, and the migration of a lot of projects to GitHub. In fact, most of Microsoft's own projects moved to GitHub as well. This means that access to source codes, downloads, documentation and more is still provided after the shut down of the site's core. No, the announcement was made on March 31, 2017 by Microsoft. Another example of why the cloud is not the place to work or play. One day it’s there. The next day it’s gone. Every day is April Fools day. Could have say the same thing with physical disks. There is no easy way to store information long term. At one point or another, you have to spend few weekends copying everything from floppy disks to zip disks to CDs to DVDs to external HDDs to SSD drives to… With the cloud, just upload a backup and walk away… done. That reminds me, I still have school essays in those zip disks. The zip drive broke down, and too lazy to find a new one. I have a usb 3.5 inch disk drive. I bought it cause I came across an old disk a few weeks ago and I was curious if it still had the info or not since it was a disk from my pascal class from the senior year of high school in 1992. It did. Unfortunately, WIndows 10 said no to running any of the program exes since they were DOS. I saw this on Friday, I just hope the project I’m working on gets ported to Github or somewhere, I only just created an account on Github last week.